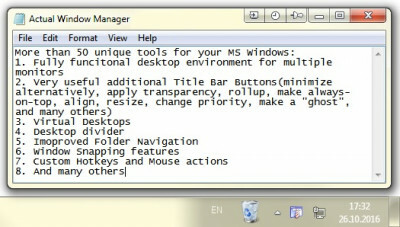 Actual Window Manager 4.5 is automation tools software developed by Actual Tools. Thinking about having 2 desktops instead of one to avoid constant switching between windows? Save your money and relax now! Try Actual Window Manager and you will like your work more! Eliminate the need to minimize and restore windows, free the task bar space for more urgent programs and exchange information between applications immediately by using such handy tools as Stay on Top, Minimize to Tray/Screen Edge and Roll Up! No stress, no problems! This program is shareware, which means you can download and use Actual Window Manager 4.5 for free during 30-days trial period. After this period you gonna have to buy Actual Window Manager 4.5 software for $59.95 or uninstall the program. Actual Window Manager 4.5 supports English, German, Russian, French, Spanish interface languages and works with Windows 98/XP/Vista. Latest Actual Window Manager 4.5 does not contain any spyware and/or advertise modules, allowing installing it with no worries concerning valuable information loss. Our website has thoroughly tested system utilities product Actual Window Manager 4.5, written the review and uploaded installation file (3349K) to our fast server. Downloading Actual Window Manager 4.5 will take minute if you use fast ADSL connection. 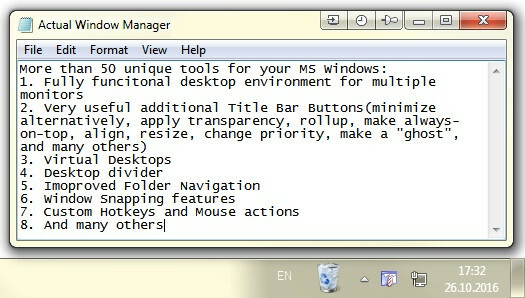 Resize programs automatically,transparent windows,minimize to tray,stay on top.